I have been on this LotteryWest Disability Equipment Grants program since it started close to 10 years ago. 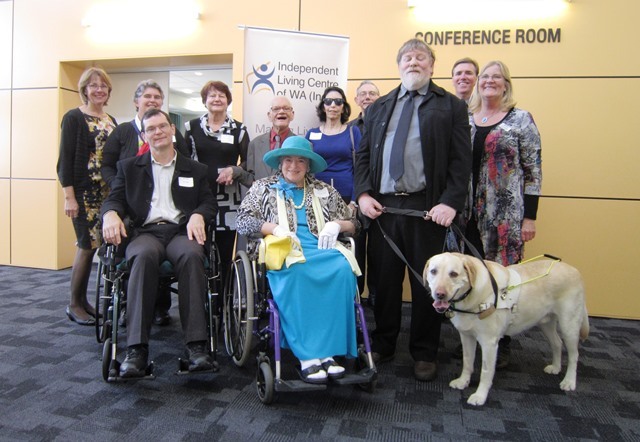 Back then, With a budget of around $500,000 I marvelled at how small grants could turn someones life around by giving them the tools they needed for independence . Of all the committees, boards, councils and advisory groups I have been on this one really gives me a sense of the community we are part of. “from little things, big things grow”. I’ve been working at the Independent Living Centre for nearly one year and what a huge learning curve I’ve been on. With the ILC providing a range of services it takes a while to learn about each and every one of them. I know of and often hear about our grants and funding programs but today it really hit home about the difference these grants make to people’s lives. Ms Andrea Mitchell MLA, Parliamentary Secretary to the Minister for Disability Services, presented a $2.2 million cheque on behalf of Lotterywest to the ILC for the Disability Equipment Grants (DEG) Program. Following this, people who have received grants told their stories. Lee, a man in his early seventies who has cerebral palsy, told how he began using a computer when he was 63 and how specialised computer equipment, purchased thanks to a DEG, has enabled him to share his sense of humour and communicate more with people as well as allowing him to pay his bills online and be more independent. Belinda, mum of six-year-old Mikayla, who is diagnosed with Aicardi Syndrome and is dependent on her wheelchair to get around, shared how being able to convert their car into a wheelchair accessible vehicle has made a huge difference to their lives. Transferring Mikayla in and out of the car is now a lot less strenuous and makes decisions such as popping down to the shops with the kids to grab a loaf of bread much simpler. These are just two stories – last year over 570 grants were provided to individuals to assist with funding equipment through the DEG program.